I hope you guys had a very Merry Christmas yesterday! Ours was nice, but kinda crazy and it feels so good to have nothing to do today. 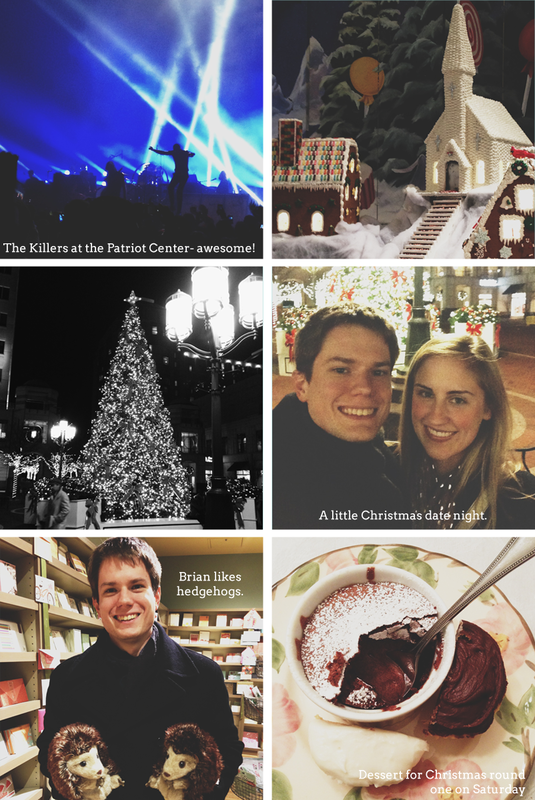 While it’s still fresh, I thought it would be fun to spend some time documenting our Christmas season on here this week. This Christmas season was the busiest that I can remember. And I don’t mean that in a “we were so happy to have fun things to do every second” kind of way- I mean that it was a race to the finish between work and finishing up all that had to be done. I didn’t mail my Christmas cards until Christmas Eve! (more on those later) But amongst the craziness, we were able to fit in a lot of fun things. On the 18th Brian and I went to see The Killers with my dad and my brothers. It was my third time seeing them an they were awesome. They seem to get better and better. Even if there were some crazy people on the floor with us, we still had a really good time. We still celebrate Christmas with both sides of my family, so on Saturday we did an early Christmas celebration with my dad’s side of the family. Dinner was delicious, and for dessert my mom made individual chocolate souffles and my aunt made some amazing cupcakes. I got the Smitten Kitchen Cookbook AND What Katie Ate– I love them! I’ve been drooling over the pictures, but I’m excited to actually make some of the recipes- maybe that will jumpstart my cooking a little in 2013! That’s all for now- I’m hoping to document more this week. Tell me friends: what are you up to today? Brian is working, but I’m taking this week off to regroup. I’m hoping to make some goal lists and maybe start a new book today! Sounds like a great Christmas! I’m taking some time off too. Trying to relax and get things together so I can hit the ground running come 2013. Me and my couch are getting even more acquainted. I’m still in a Christmas coma.